After caring for and losing her mother to Breast Cancer, Libby discovered that Team In Training offered a way to fight cancer and to fulfill her life-long dream of being a cyclist. 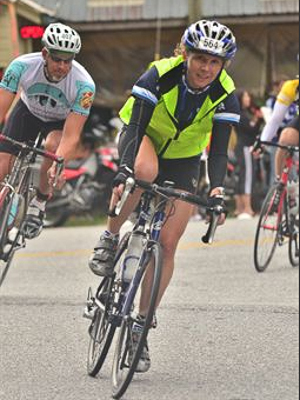 Libby joined Team In Training in 2010 as a cyclist on the Wilson 100 cycling team. Since that first experience, she served as a Mentor and participated in six centuries with TNT. Being selected as part of the 2014 RAAM Team In Training Georgia Chain Gang is a privilege and tremendous honor. The funds raised will help lessen the physical and financial burden cancer bears on families and provides hope for cures in the future. Since 2010, cycling has taken Libby all over the United States including the southeast, Hawaii, Colorado, California, Montana, and Wyoming. Cycling also took her on a great adventure to the French Pyrenees. If Libby is on her bike, then she is smiling and full of joy. Libby was born and raised in Atlanta. She resides in Brookhaven with Charlotte, her partner of 18 years, and their three rescue dogs. Libby graduated from Salem College in Winston-Salem, NC where she received a degree in Philosophy. The Philosophy major comes in handy during the long training rides! Jeannie grew up in an athletic household in the Midwest where her focus was primarily on the diving board and running. She was a diver at UNC-Chapel Hill where she met her husband, Eric, who was a very successful swimmer. She also grew up in the shadow of a brother who was competitive in cross country, swimming, triathlons, and cycling. Jeannie tried triathlons in her 20s, but cycling never really stuck until her first Team in Training century at Lake Tahoe in 2008. It was that event where, thanks to her current teammate Jerome, she pushed herself harder than she ever had and began to believe she had strength as a cyclist. Participating in a TNT event also taught her the impact every individual can have when working together to pursue a cause that means so much. If it weren’t for advances in treatment developed by LLS, Jeannie would not have had the privilege of a close friendship with our Remembered Hero, Warren Bruno. Jeannie works in the public broadcasting industry for an independent non-profit called Greater Public and provides services focused on strengthening the digital capabilities of stations around the country. Her entire career has been focused on emerging technologies while working for IBM and The Coca-Cola Company prior to her current responsibilities. Jeannie has been living in Atlanta for the last 20 years. Her husband, Eric, is the Aquatics Director for the City of Atlanta and has always been incredibly supportive of her cycling. They have three children: Ellen (17), Jack (15), and Cari (12). Her son, Jack, is also an avid cyclist working at Decatur Bikes part time. He has turned their basement into a bike shop to work on Jeannie’s bikes and his own four bikes. Each year since Tahoe Jeannie has been looking for new challenges and building up miles and finding new friends in the cycling community. She is honored to be part of the RAAM team, excited about pushing herself to new levels, and driven to raise funds that will make a difference in the fight against blood cancers. A proud crew member and one of the “Five Daves” of the Georgia Chain Gang’s 2010 RAAM team, Dave (#4) is very excited and truly honored to be doing the pedaling this time for the 2014 team entry. Riding shotgun in the chase van for 3000 miles was an eye opening and awe inspiring event in his life, and gave him plenty of time to reflect on the greater cause and purpose at hand. He owes the privilege of his association with the Chain Gang by none other than our friend, neighbor, spirit of our cause and our honored hero, Warren Bruno. To Dave, The Georgia Chain Gang represents a true celebration of life and the good fight to save lives. 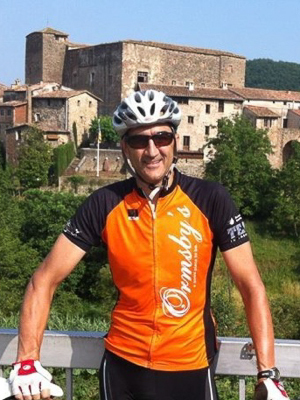 A native of Boston and graduate of Georgia Tech, Dave discovered cycling on the back roads of Andalucia and Sicily while based in Southern Spain as a Navy C-130 pilot. Fast forward more than a few years later, and he continues to regularly log miles in Europe on layovers while fulfilling his duties as an A-330 pilot for Delta Air Lines. Dave rides with the support of his lovely wife, Jessica, and his two sons, Max, a junior at Georgia Tech and Cooper, enjoying his first year at Oxford College at Emory University. The Glucks live in the Morningside neighborhood and actively support the public school, cycling and green space communities of Atlanta. The Race Across America has been on Andrew’s bucket list since he started racing bikes back in 1991. That list became a bit more immediate in 2004 when Andrew was diagnosed with CML. With an oral chemo called Gleevec giving him time and a extensive support group which eventually included Team in Training, Andrew decided to return to competition. He put RAAM on hold and focused first on triathlon, becoming the first Leukemia Survivor to qualify for and compete in the Hawaii Ironman World Championships in 2006 while raising almost twenty thousand dollars for TnT. After a four year “retirement” Andrew fulfilled a promise he made when first diagnosed to become the first Leukemia Survivor to win the Overall of an Iron Distance Triathlon in 2012. And while it’s never been a “honey do” so much as a “honey may I”, Andrew now plans to scratch RAAM off his bucket list in 2014. As a former professional cyclist both in the U.S. and abroad, Andrew has paid dues he knows will help in his two wheel journey across the country. And the fact that each mile he pedals is another dollar earned for blood cancer research is like a perpetual tailwind for him. The biggest obstacle may very well be finding the time. Author of Holistic Strength Training for Triathlon as well as an app for smartphones entitled Daily Tips for Holistic Health, Andrew is in the midst of his second book due out in 2014. At the same time, Andrew is the owner of Triumph Training where he works as an Exercise Kinisiologist, teaching clients how to think, breathe, drink, eat, move, and sleep properly. All six of those Foundational Factors of Health will be sorely tested during the race from Oceanside to Annapolis. But his knowledge of both health and performance should be enough to help him endure the journey and likely even cross the finish with a smile on his face. Unfortunately for his teammates, he just may have to sacrifice the occasional shower. Dave first participated with The Leukemia & Lymphoma Society’s Team In Training in 1999. Since then he and his wife have continued to train, coach, and raise money to help The Leukemia & Lymphoma Society defeat blood cancers. Although Dave didn’t have a personal connection to blood cancer victims when he started, over the last 10 years he has met many patients, survivors, and families that have been affected by these cancers. He truly appreciates the day to day difference that the money raised makes in these peoples life. As a crew member in 2010 and a rider in 2012, Dave learned valuable experience that will pay dividends this year. With experience in professional and amateur motorsports as well as experience in coaching and training, Dave believes he has the skill set’s for RAAM and is excited to be a rider with the Georgia Chain Gang again this year. Dave, his wife Elaine, and their 2 kids have been in the metro Atlanta area for the last 23 years. 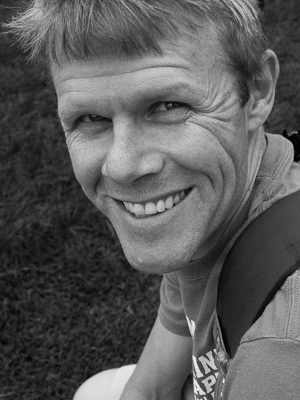 He studied mechanical engineering at Southern Polytechnic University in Marietta, GA, is a USA Cycling certified level 2 coach, and a Team In Training certified cycle coach. He is project manager at Brink’s Engineering in Marietta. Follow Dave’s blog as he writes about his training and competing with the Georgia Chain Gang: http://ridemetal.blogspot.com/. Jerome has been cycling on and off since 1982. 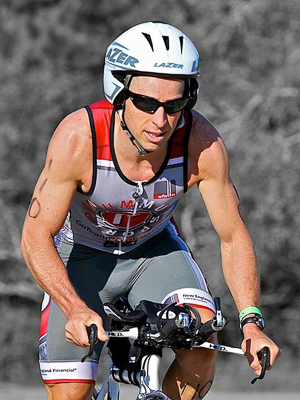 He has competed in various cycling races and events through out the Southeast. He is an avid endurance cyclist and is enthusiastic about the RAAM race. 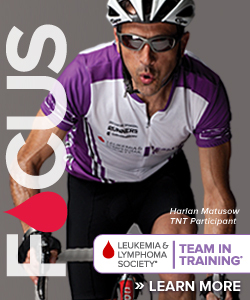 He is excited about the opportunity that The Leukemia & Lymphoma Society’s Team In Training (TNT) gave the team. The goal of the team is to help TNT raise money and awareness for the cure of blood cancers. Jerome grew up in the Atlanta area and attended Woodward Academy where he graduated in 1981. While at Woodward he was co-captain of the 1980 state championship football team. He made all state and was selected to play on the GACA All-Star team. He then attended the University of Georgia and graduated with a B.S. degree in Agricultural Economics. While at UGA he played on the 1981-82 Georgia Bulldogs football team. They won the Southeastern Conference Championship that year. Jerome had a career ending knee injury spring of his freshman year and retired from football. He then took up cycling to help his rehabilitation. He is a home builder and developer and prides himself on building eco-friendly “green” homes. Jerome is a partner at Paces Builder Group, a custom home building company in Atlanta, Georgia. Ben’s interest in cycling began when he was a teenager in Dallas. In fact, he still owns the object of his childhood affection – a canary-yellow, Schwinn Super-Sport…complete with down-tube shifters! But Ben’s ‘interest’ in the sport became a passion after the tragic death of his daughter, Lauren, in 1998. She had been diagnosed only weeks earlier with Acute Myeloid Leukemia (AML), but despite round-the-clock care and the most advanced treatment available at the time, didn’t survive. As a result, Ben and his entire family have a never-ending drive to do whatever they can to prevent blood cancer from claiming more lives. Ben rode his first Team in Training Century 10 years ago and since then, has completed 100-mile rides in Lake Tahoe, Tucson, Hawaii and Dahlonega…raising over $120,000 for the Leukemia & Lymphoma Society. In 2009, Ben and his daughter, Carolyn, crossed the finish line in Tucson together…her first Century and a reminder that supporting the fight against blood cancer can be a family affair. During the past decade, Ben’s participation with Team in Training has resulted in new friendships, both on and off the Team. Each year, he tries to meet other children and families undergoing treatment by re-connecting with the ‘special friends’ at Children’s Healthcare of Atlanta (Scottish Rite) who cared for Lauren. The hours he chooses to spend in the saddle always remind Ben of the days these children have to spend in their hospital rooms during their fight against leukemia. A graduate of Southern Methodist University, Ben and his high-school sweetheart, Nancy, have lived in Atlanta for 27 years. He is a published author, lecturer and Managing Partner of LCS Partners, Inc., a management consulting firm focused on improving sales execution. They say Race Across America is the toughest endurance race in the world. After watching her beloved grandfather fight and lose a vicious battle against Leukemia when he was just 63, Lisa wonders if that’s really true – and is honored to be tackling RAAM with the Georgia Chain Gang to help find a cure for a devastating disease that causes pain and loss that no one should have to endure. Lisa originally got into cycling 10 years ago at the advice of her orthopedic surgeon who told her some “light spinning” would be good rehab after knee surgery from too much running. “Light spinning” turned into a lifelong passion – and in recent years alongside her buddies at ATS, tackling the toughest centuries in the Southeast has become a standing weekend activity. A five-time Ironman, Lisa is so privileged to be participating in RAAM to benefit The Leukemia & Lymphoma Society – and believes that if the funds raised by the Georgia Chain Gang help get even one step closer to a cure so that no family has to experience the loss that hers did 25 years ago, every pedal stroke will be worth it. A North Carolina native and UNC graduate, Lisa has called Atlanta home for more than 20 years. A marketing strategist, she currently works with Hothouse – a marketing and promotions company that ideates and executes custom solutions for top companies in the sports and cable industries. Good luck!! You are going to have the time of life. Each of you are an Inspiration to Us All! Best wishes on a Successful trek across America in 2010. Jerome Rossetti is not as skinny as the other guys. Can he really ride that far? You bet your bippe he can – Go Jerome!!! Have a great ride guys! I am in awe of your work and what you are about to do. I will be following you every step of the way. I hope that you do well, are safe this year (!) and have a fantastic experience. My thoughts and good wishes for a fantastic journey across the USA!! Dave and the Gang- good luck! Watch out for gravel, and I guess dead skunks, in the middle of the road…and Stay on the bike this year!! I can hardly leave my computer screen… following each time stop and new posting. You are a team of incredble heart, dedication, and skill. Stay safe and ride you ASSES off! If Fat Bottom Girls make the Rockin’ World go round (QUEEN), you all make the cycling world go round. Met some of the team during breakfast in Alamosa, CO. Tough riding in the Rockies AND for a great cause. Safe riding. All of us in Fort Lauderdale are cheering you on! Godspeed….you are AWESOME! Yeah! Awesome Job! Just sent Maureen 1000 dollars! Keep on going full steam ahead! very impressive what you are doing. good luck. I am so proud of you guys as you continue on your trek. I have been in Europe the last 5 days, but have been following your moves all the way through. I’m in awe of what you are doing, and want you to do well, and most importantly, stay safe! Keep pushing guys! Just got Tony’s Tweet about the homestretch! You guys are great and We are all pulling for you! Trying to contact Lisa. You go girl! You never cease to amaze me. Email me and I’ll send you my phone and new address. Love you!! !